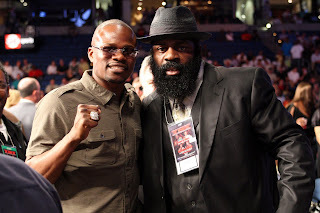 Kimbo Slice, who headlines the EliteXC mixed martial arts fight card on Saturday, May 31, on CBS, and WBC super welterweight champion Vernon Forrest, who looks to defend his title against Sergio Mora on Saturday, June 7, on SHOWTIME, pose together at Saturday night’s light heavyweight world championship doubleheader in Tampa. The always entertaining Kimbo was interviewed by Al Bernstein during Saturday’s telecast. You can catch the interview during a replay of the thrilling SHOWTIME CHAMPIONSHIP BOXING telecasts, which featured a war between WBC Champ” Bad" Chad Dawson and Glen Johnson as well as a flashy performance by the always entertaining Antonio Tarver against IBF champion Clinton Woods. Wednesday, April 16 at 10:30 p.m. ET/PT on SHOWTIME. The telecast is also available On Demand starting this Tuesday and ending on Monday, May 12 where available.